There’s a new commercial for DIRECTV starring Peyton Manning, quarterback for the Denver Broncos. As with other ads in the series, we have two versions of the star—Manning in this case: one is a suave, well-adjusted customer of DIRECTV; the other is a pathetic version of himself who is a cable customer. In this new ad, the pathetic Manning’s defining characteristic is his freakishly high voice. Instead of being able to watch all the NFL games on his mobile device like DIRECTV Peyton, really-high-voice Peyton sings with the Four Tunesmen—a barbershop quartet, appearing complete with Shakey’s uniforms. We get to hear them sing “The Camptown Races.” Well, that got our attention. We looked around to gauge the “buzz” on the ad and found a Fox program that seemed to be having a lot of fun with it, heaping on mock indignation about the slight against barbershop quartets. They even interviewed a barbershop expert who tried to look serious as he condemned the ad for erroneously having Peyton, in the job of first tenor, carry the melody. Now, we’re not aficionados of the genre—we just love our American, Peerless, and Haydn Quartets—but yes, the second tenor would usually be the one carrying the melody in most of the arrangements. That means second tenors Billy Murray, Henry Burr, and Harry Macdonough of the American, Peerless, and Haydn, respectively—instead of first tenors John Bieling, Albert Campbell, and John Bieling (he was in demand). But that wasn’t always the case with all quartets. The most notable example we can think of would be the Fisk University Jubilee Quartet. 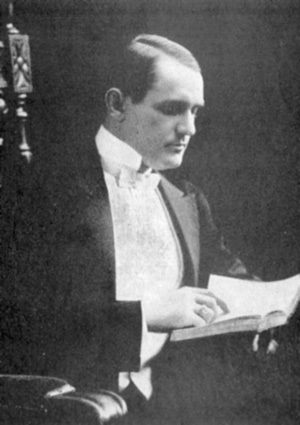 Director John Work II was the group’s first tenor on the records made between 1909 and 1916 for Victor, Edison, Columbia, and Starr, and he sings lead on a number of the arrangements. It is indeed a very odd thing to hear at first. Once you get used to it, of course, these songs have a beautiful, disarming quality. The commercial really plays up the high speaking voice of Peyton. Some first tenors have higher-pitched speaking voices, but they are not usually so comically high-pitched (in fact, these days a lot of the first tenors are just regular tenors or even baritones who are faking it with falsetto). We wondered whether the ad-maker were really suggesting Peyton was a counter-tenor—that is, a male voice in the range of a female contralto or mezzo-soprano. The most famous counter-tenors of the early recording period were Richard Jose and Will Oakland. If you’ve never heard these two, they’re something else.